SITUATIONS presents a two-person exhibition with painter Mariah Dekkenga (b.1978, Marathon, WI) and sculptor Ioanna Pantazopoulou (b. 1984, Athens, Greece). The exhibition opens January 13th and closes February 25th. A reception will be held on Saturday, January 13th. The exhibition includes three new paintings by Mariah Dekkenga and two sculptures by Ioanna Pantazopoulou. The impetus for the exhibition was to explore phenomenological engagement. By installing Pantazopoulou’s sculpture, that doubles as a hammock, within the sightline of Dekkenga’s painting, the viewer experiences both works of art in a more physical way. This relationship illuminates both artists’ awareness of the crucial and complex role of the body in making and experiencing art. Additionally, Dekkenga and Pantazopoulou share a tendency toward a vibrant color palette. For Dekkenga, the decision is calculated. Building upon color theory, she sets up the challenge of using a vast range of colors in a complex composition. Her carefully crafted paintings on shaped canvas have a thick impasto underlayer. On the surface, a myriad of colors meld into other hues within the rhythm of the work. In contrast, Pantazopoulou’s approach to color is more randomized. Materiality dictates the colors used. Found objects form the foundation for her sculptures and the original color of the object remains intact. 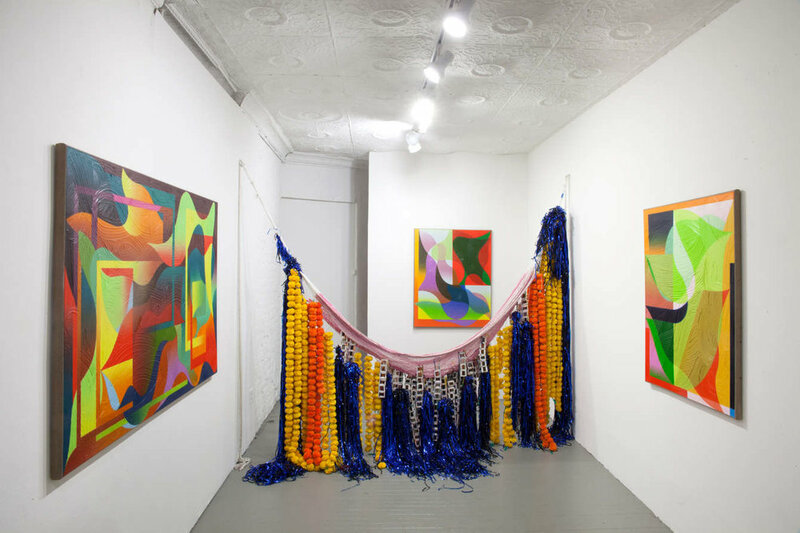 For example, discarded dental slides, orange plastic marigolds, and shiny blue tinsel is connected to a pink hammock strung across the gallery. Although approach differs in both artists work, a masterful use of color remains a unifying force. MARIAH DEKKENGA (born 1978, Marathon, WI) lives and works between Doha, Qatar and Randolph, VT. She graduated from The University of Iowa with a MFA in 2008. Dekkenga has held solo exhibitions at Eli Ping/Frances Perkins, New York and selected group exhibitions include The Hole, New York; Denny Gallery, New York; Clifton Benevento, New York; Suzanne Geiss, New York; and The Fire Station, Doha Qatar. Dekkenga has participated in residencies at the Babayan Culture House in Cappadocia, Turkey; Takt Kunstraum Tapir in Berlin; and Officina Stamperia del Notaio in Tusa, Spain. (Brooklyn, NY). Her work has been included in several group exhibitions at The Athens Conservatoire (Athens, Greece, presented by NEON), Hydra School Projects (Athens, Greece), Grand Union Gallery (Birmingham, U.K), and with JAG Projects (Hudson, NY and Miami, FL). Ioanna has an upcoming solo exhibition at Ileana Tounta Contemporary in Athens, Greece opening March 22nd. SITUATIONS is located at 127 Henry Street in the Chinatown neighborhood in Manhattan. The space is run by Mariah Robertson and Jackie Klempay. Open Thursday - Sunday 12-6 pm. For more information and images, please visit our website www.situations.us or write to info@situations.us.